Like the Cincinnati Mural Project, Huntsville has turned to its youth to revitalize the city through arts. In Cincinnati, teenagers are hired and trained to create murals to beautify the city alongside an experienced artist. It has transformed some tired areas of Cincinnati and turned them into expressions of art. 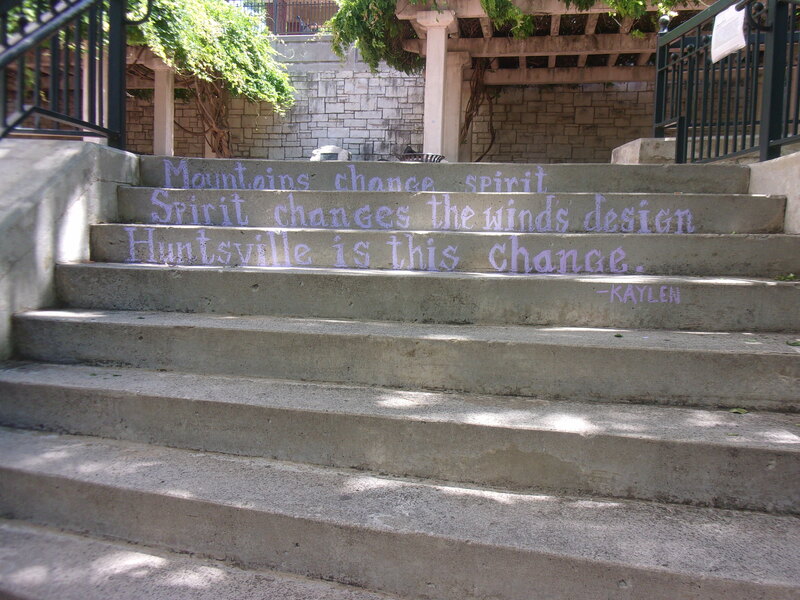 When I took a walk near Big Spring Park and the downtown district of Huntsville, I noticed words painted onto the city steps. Interesting, provocative reflections on the city. Haikus. Written by 8th graders who found a way to incorporate creative artisty and city growth. Haikus were simply their medium. It’s amazing what Millennials are coming up with when given the task to create and transform. Sometimes modern, other times traditional. We’re getting a glimpse of how how the future generation sees the world. I, for one, find it an exciting time. How do these city beautification/revitalization projects make you feel? I know! I hope we continue to see this trend. It does speak well for the future. 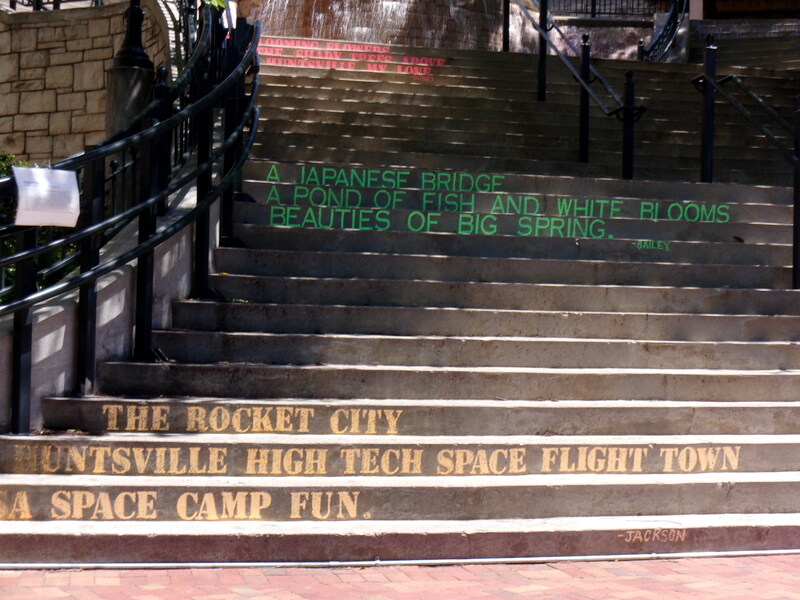 I love haikus and yours is perfect for Huntsville! What a great way to showcase young talent and beautifu the city at the same time! Isn’t it? I love art, but the written word as art is the most appealing expression to me. I wished there’d been more haikus! What an interesting idea – love the positivity and creativity involved in this project. Love the way they chose to represent their city, too. Lots of pride in those haikus. I love poetry, and to see this visual way the city of Huntsville has brought this into their landscape — well, I was impressed with the city on my visit in May, but this makes me like them even more :). Yes. Huntsville was full of surprises. I’m all for allowing our young people the scope to take more responsibility for their world generally. Our generation has made a pig’s ear of it. And urban art is one way in which their influence can show. We need their energy and ideas. In the last few hours we’ve seen in the UK how recruitment of the younger vote can change the political landscape. Long may it continue. I know. We can sit back and watch now. This younger generation is doing some great things. That’s a lovely idea – allowing young people to take the lead and showcase their creative side. It will build a nice bond between the youth and the city. It’s quite a creative way to use the staircase steps for art! I love that idea! I love the idea of passing a sense of ownership for the town and park to the youth in the neighborhood. These kids are the ones most likely to abuse the parks and put up graffiti. By using their creativity as a positive force, they are now dedicated to the park and the city. Huntsville does so many things right. Love that city. I’ve never seen art like this! 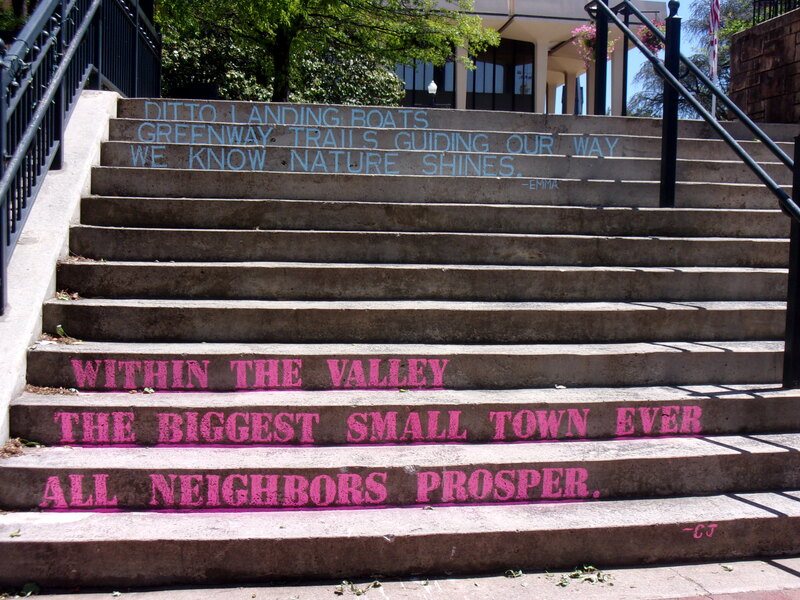 The haiku on the staircases provides a great way for youth to express their creativity, and for us to see how they view their city! Wow that’s so creative! I really love how they allowed teenagers to create art and express their thoughts!